It’s Creed! Not Rocky VII! Creed is a return to the world of the Philadelphia champ but it’s not really about him. It’s about family lost, and found; it’s about pride in oneself, and the value (or not) of legacy. Most of all, it’s a fresh riff on a classic genre of film – the boxing movie. Adonis Creed is the illegitimate son of the late Apollo Creed (Carl Weathers, seen briefly in photos) – who died before he was born. After his mother died, Donnie is placed in the foster care system and had a habit of fighting – which changes when his father’s widow, Mary Anne (Phylicia Rashad) tracks him down and takes him in. Now Donnie (Michael B. Jordan, Fruitvale Station, Chronicle) – well-educated and recent recipient of a big promotion at work – has decided he’s not white collar type, quits his job and moves to Philadelphia. There he tries to persuade Rocky Balboa (Sylvester Stallone) to train him, meets a beautiful singer/composer and gets his first legitimate fight (as the film opens we see him knock out a pushover in an unsanctioned brawl in Tijuana). The film builds to a bout for the light heavyweight championship of the world against a temperamental Liverpudlian named Pretty Ricky Conlan (Tony Bellew) and, make no mistake about it, the fights are the crowd-pleasing set pieces but they work in service to the film’s heart. Heart means finding what you most want to do with your life and finding a way to make a living doing it. Heart means finding your family – by blood and by choice – and making sure they know where they stand with you. Heart means finding meaning in your life – whether in your career, your family or, if you’re lucky, both. Donnie’s family connection to Rocky begins with respect and a seeking for knowledge and culminates in Rocky and Donnie learning about each other and learning to live with each other. Donnie might have come to Rocky to ask him to train him (seeking knowledge), but before Rocky ever decides to help him, he’s calling the former champ ‘Unc’ – and the two feel like they’re surrogate uncle and nephew. Donnie’s family also includes Bianca (Tessa Thompson, Veronica Mars, 666 Park Avenue) – the singer/composer whose music at first keeps him awake (she plays it loud for a reason), then brings her into his life. Their relationship isn’t an easy one but it feels authentic. Jordan is terrific as the rough-edged kid who wants to be a fighter; who has had to scrap for everything he’s got (you know he busted his @$$ to get that promotion!) and has finally found what he’s meant to be doing. Rashad is solid in a very brief role, making her few scenes sparkle with intelligence and wit as well as emotion. Thompson is stellar as the hard won object of Donnie’s affections. 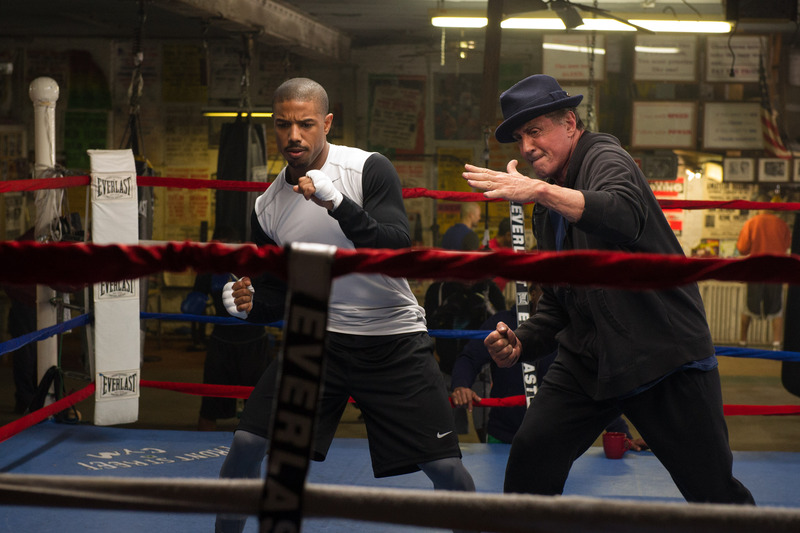 It’s Stallone, though, who gives the performance of his life here in what is essentially the role that Burgess Meredith played in Rocky – the source of wisdom and inspiration; the catalyst that allows Creed to reach his potential in a hurry. His life isn’t what he’d hoped for – though he’s a successful restaurant owner – because everyone he ever loved has moved on and he’s still here. He’s ready to move on himself – he’s even given an opportunity to move on – until Donnie gives him an ultimatum (and we know much Rocky loves ultimatums…). I won’t spend too much time on the training montages and fights – others will no doubt go to great lengths to describe them and read stuff into them – except to say that each fight is different; one for each stage of Donnie’s career: self-taught wannabe; accepting student, and mature fighter. Both the training montages and fights look and feel different from anything we’ve seen before, though they echo events from the Rocky without being slavish or too obvious. After all, no one gives a hoot about the fights if the characters aren’t real to the audience. Director Ryan Coogler – who co-wrote the script with Aaron Covington – has produced a film about life that features boxing (okay, a lot of boxing), none of which would matter if he hadn’t had fully realized characters. It says a lot that this movie isn’t a Rocky movie but feels like one. Stallone wasn’t interested in returning to the role but Coogler pitched Creed to him and it became the first film to feature Rocky Balboa that wasn’t written by him. Sure, Creed hits a lot of beats that you will find in most boxing movies, but it doesn’t feel like just another boxing movie – because it isn’t. It’s something else – it’s a story about real people who have real lives and feel real emotions. In the end, it’s not Rocky VII – it’s Creed I! Photos by Barry Wetcher/Courtesy of MGM and Warner Bros. Previous PostMarvel’s Jessica Jones – Shades of Hammett, Chandler and Lee!Next PostUncivil Trailer: Captain America: Civil War!